Law enforcement officers apprehended Aubrey Sanders, 31, just after 11 p.m. near Sunny Slope Road. James Hill, 31, was caught about 10 p.m. behind Rite Aid Drug Store on West Main Street. The pair spent about 12 hours in the run after crawling through the gate of a fence at the Cannon County Jail. One other person, identified as Lisa Winslow, who was reportedly helping one of the escapees, was also taken into custody. Charges against her are pending. According to a NewsChannel 5 report, Sanders was arrested along Sunny Slope Road after a tip around 9:40 p.m. He apparently collapsed after running from officers and getting caught in a fence or bushes. Hill was caught wandering through the streets of the town of Woodbury around 11 p.m. near the Woodbury Church of Christ. "We get everybody heading this direction, we pull up, see them running. 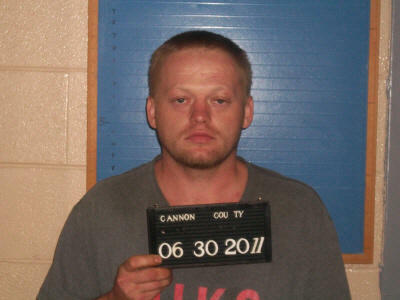 There's a female involved, she's in custody also," said Cannon County Sheriff Darrell Young. It's not clear at this point who the woman is or what role, if any, she had in the escape plan. Check back to CannonCourier.com for additional information as it develops. As dusk began to settle over Cannon County Wednesday evening, the manhunt for two escapees from the Cannon County Jail picked up steam. Joining the search which involves a number of area law enforcement agencies were U.S. Marshals and special units from the Murfreesboro Police Department. Although there have been reports of sightings of the two men from around the county, the primary area of the search continued to center in the Water Tower Hill area west of Stones River Hospital. Around 100 law enforcement officers are reportedly involved in the manhunt. Scores of law enforcement agencies were still searching late this afternoon for two escapees from the Cannon County Jail. Officers were checking areas throughout the county but as of 4:30 p.m. they had not been apprehended and authorities had no solid information as to their whereabouts. The pair reportedly escaped just before noon today and headed west, crossing Doolittle Road and heading toward Water Tower Hill west of the hospital. Tracking dogs from the Rutherford County Sheriff's Department and a THP helicopter are assisting the Cannon County Sheriff's Department and Woodbury Police Department in the search. The two 31-year-old men have been identified as James W. Hill of Liberty and Aubrey Sanders of Murfreesboro. Both men were said to be wearing white pants and white t-shirts. They were reportedly cellmates at the jail who escaped from a workout area outside the facility. Cannon County Sheriff Darrell Young said they escaped by pulling wire up at a gate and crawling through. Hill was in jail on charges of attempted murder and Sanders on a variety of meth charges. Hill is considered to be dangerous but Sheriff Young said neither men had a weapon. They were seen running toward the woods by hospital employees. Anyone with information should call 563-4322. "pulling wire up at a gate and crawling through"
What ingenuity, who would have thought an inmate would have done that? Good job, Darrell and your team. Good job Sheriff Darrell and Deputies and everyone involved. The one thats in that for attempted murder,I hope the system and/or jurors do better than what they done for the little Florida girl.